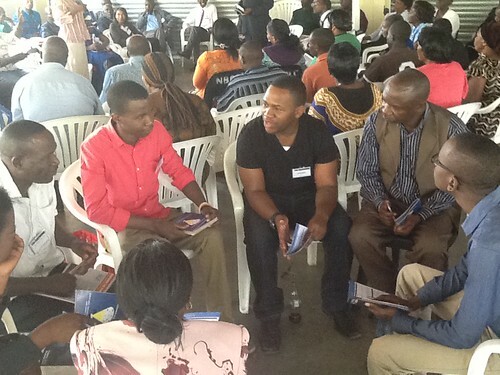 On October 25th and 26th 2013, Northrise University sponsored a team to participate in the 2013 Zambia Global Leadership Summit conducted by Willowcreek Association at Bread of Life Church in Ndola. The Northrise team, one staff member and four current students, participated alongside 400 others drawn from a cross spectrum of leaders in the Copperbelt area and surrounding provinces of Zambia. “The Global Leadership Summit has been an awesome enlightening experience in my life. My leadership skills have been sharpened” Venassie Mibenge. “The Summit was a great eye opener for me. It has been running for three years, yet this was my first time to attend. I thank Northrise management for sponsoring me to attend. Bill Hybels the keynote speaker and other speakers brought out profound and tested truths on leadership.” Christopher Mubanga. Great things are happening in Zambia, and Northrise University is helping to make that happen! The Northrise team participating in a group discussion after a presentation on the courage leadership requires by Bill Hybels, founder and Senior Pastor of Willow Creek Community Church.